I'm not sure there's anything more rewarding, as a designer, than to be able to contribute creatively to the improvement of ones own neighborhood. The City of Portland (Maine) developed a master plan for Libbytown's Dougherty Park nearly 10 years ago. Since then, the city has phased in improvements including a quarter-million dollar skatepark which often accounts for the majority of park patronage. The park has, however, long-since lacked a proper playground. Now, as Libbytown residents ourselves, we had an opportunity to assist our neighborhood association with a CDBG Grant application. Our neighbors banded together to draft our proposal requesting more than $150,000 for the playground. 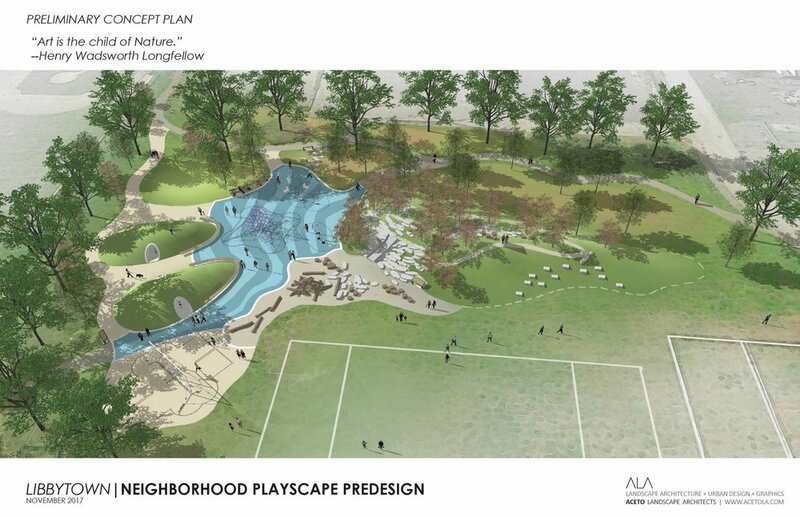 Our concepts and drawings helped convey a vision, not just for a playground, but a social gathering space for children, adults, neighbors, and friends. Through the process, I learned that playgrounds are truly much more than simply swings, and monkey bars. They are meeting places, a crucial underpinning to the community fabric.